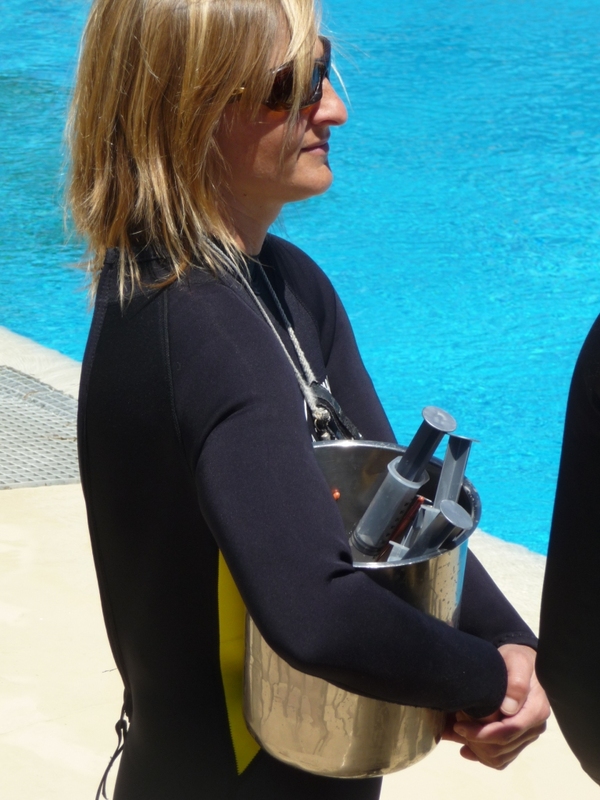 Regularly assessing the health of captive dolphins is very important to their well being. In order to minimize stress to the animal, health assessment procedures are practiced frequently. These medical behaviors usually take more time and patience to train. Having the trust of the animal is key to successful medical behaviors. In this video, instead of actually taking a blood sample, the animal is asked to "present flukes", raised carefully out of the water, and a "practice" blood draw is performed. The vessel from which blood is drawn from the dolphin lies across the ventral (under) side of the flukes. It is easily seen as a dark line running across and just below the fluke surface. In practicing a blood draw, the flukes are cleaned with antiseptic and finger pressure is applied to the vein to simulate a needle stick. 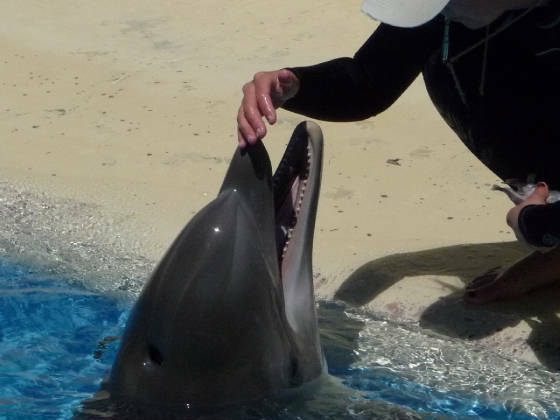 Although upside-down in the water with its blowhole under the surface, the animal reacts appropriately when it needs a breath and the trainer gently turns the animal dorsal side up for air. Another frequently applied health assessment technique when working with captive dolphins is to have the animal "chuff" (cough) onto a specially prepared absorbent card. This respiratory system sample is then evaluated for microorganisms and other substances which could affect the animal's health. Since the dolphin inhales air directly into its lungs (it has no sinuses or "nasal hairs" to protect the lungs from the receipt of foreign materials) this chuff sample represents an accurate collection of most materials inhaled by the animal. Examination of the mouth, tongue and teeth is done by the trainer using both hands while applying a light touch to the rostrum and lower jaw. While maintaining contact with both areas, the trainer then examines the teeth, gums, tongue, mouth and throat areas. When appropriate and varied rewards are used, stress to the animal being trained is kept to a minimum. Dolphins are susceptible to many of the same diseases, infections, and conditions as man. Viral, bacterial and fungal infections may strike the dolphin. Ulcers and tumors, as well as diseases of the respiratory, digestive, excretory, immune, reproductive, endocrine, circulatory, nervous, musculo-skeletal, and integumentary (skin) systems are common. Parasites such as worms and flukes (Braunina sp., which lives in the digestive system, and Nasitrema sp. which lives in the nasal sinuses) may also infect the dolphin. The most common sites of infection in the dolphin are the stomach and respiratory system. Fungal infections of the respiratory system present especially difficult problems for cure. In Florida and other tropical areas, the combination of high humidity and warmth provide the conditions best for fungal growth and cause captive dolphins major problems. Fortunately, such respiratory infections are not easily transmissible from one dolphin to another. They are air-borne and an infected dolphin must be expelling infectious particles at the same time an uninfected animal is nearby and inhaling. Another way to assess the health of a nursing female dolphin is to collect milk from the mammary glands using a breast pump. Mammary gland milk may be analyzed for the presence and levels of specific hormones. It may also be used to study the quality of milk being supplied to the newborn calf or the quantity of milk remaining in the breast following nursing episodes. 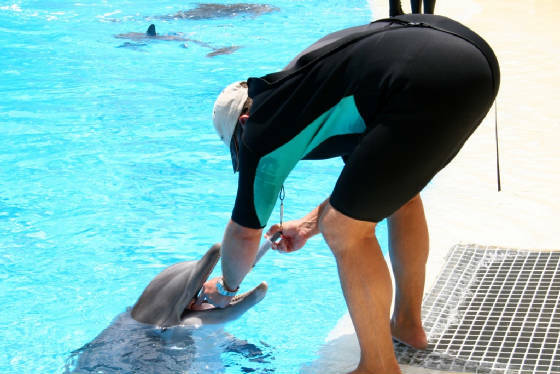 Whenever it is necessary to provide medication by way of the mouth, a lubricated tube may be placed into the dolphin's throat and the medication is transferred by way of a hand-operated syringe. Medications such as antibiotics and vitamins may be given in this manner. Medications and vitamins may also be inserted or injected into the dolphin's food and ingested by the dolphin as it eats its daily allotment of fish. Here vitamin capsules are being inserted into fish through the gill plate (or operulum) opening. Hydration may also be provided by injecting its food with small volumes of fresh water. As the fish is swallowed and digested, the vitamin or water is also digested and absorbed into the dolphin's blood stream. A variety of devices, such as these large syringes with attached flexible tubes, are used to provide medication and other supplements by mouth to the dolphin. In the following video the trainer teaches a young dolphin to accept a feeding tube through a patient approach of gently inserting it, removing it, rewarding the dolphin for accepting the procedure, then repeating the procedure, eventually injecting the supplement into the dolphin's stomach. In captivity, regular health assessments provide the veterinarian the opportunity to monitor the growth and development of the animal as well as diagnose and treat most diseases and conditions. 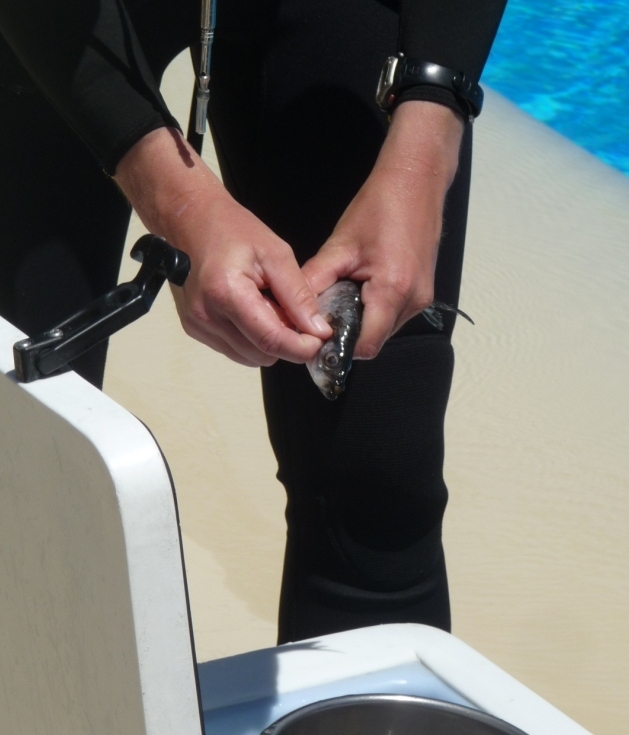 A captive dolphin may be weighed by performing a "lift" using a sling and hanging scale. Or it may be weighed by teaching it to slide out onto a stainless steel electronic scale such as this one. The edges of the electronic scale are rounded to prevent injury to the animal. 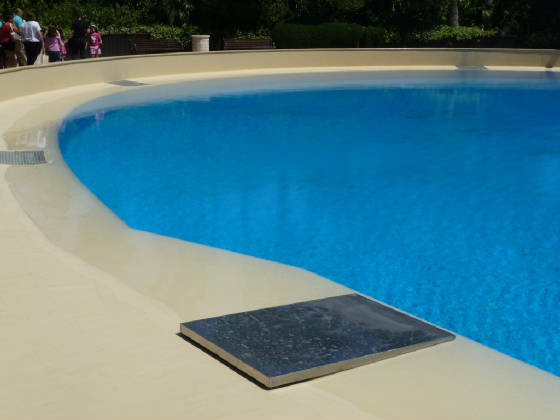 The scale is secured to the pool apron so that it will not move as the animal slides out onto it. It gently slopes down to the water's edge to allow the dolphin to easily mount it when it is necessary to record its weight. The scale is brought out each morning and taken in each evening after the daily health assessment activities have concluded.